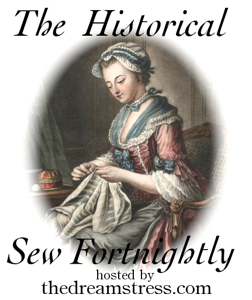 For the 11th challenge on “The historical Sew Fortnightly” – Rectangels – I decided to make something quite simple. I’ve been so busy and stressed lately with my previous (over achieving) dresses, so I needed to take it a little easy this time. 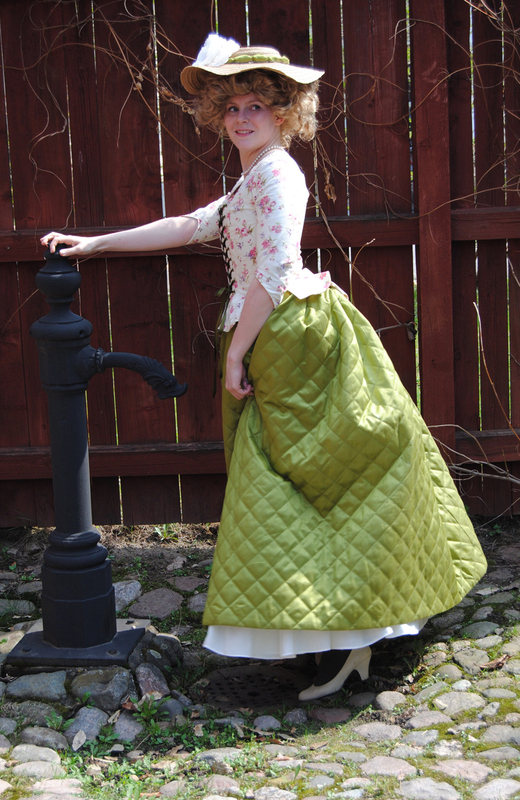 So what will be more simple and fit the theme more then a quilted petticoat. 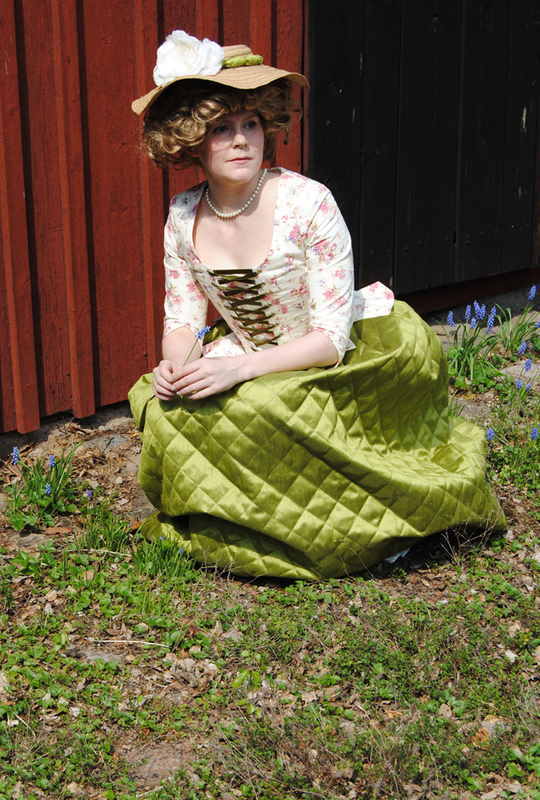 I bought some lovely green pre-quilted fabric from my nearest fabric store – I know it is kind of cheating to use pre-quilted fabric but I just didn’t have the time to hand-quilt (or even machine-quilt) a petticoat on my own this time. I used “Costume Close-up” for directions on how to cut the fabric in a historic fashion. 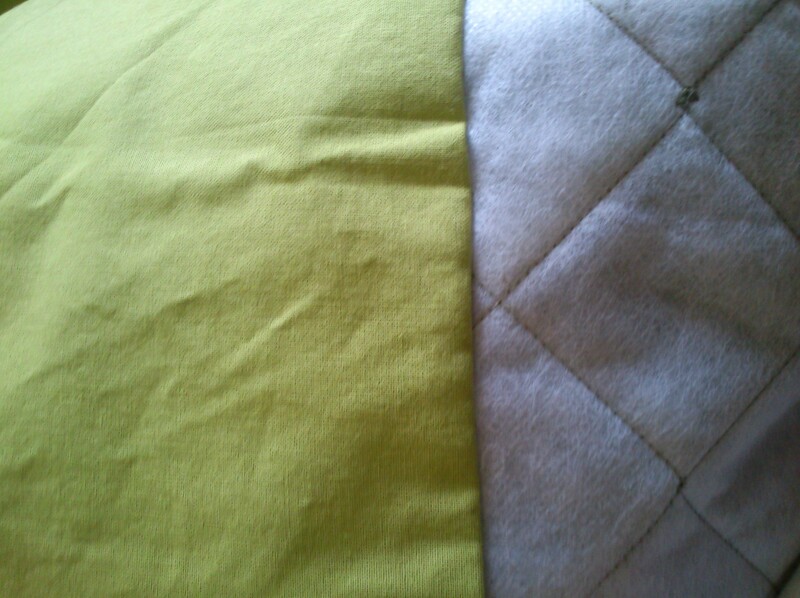 Staying true to the book I started with a rectangle, and sewed the back seam together almost to the top. 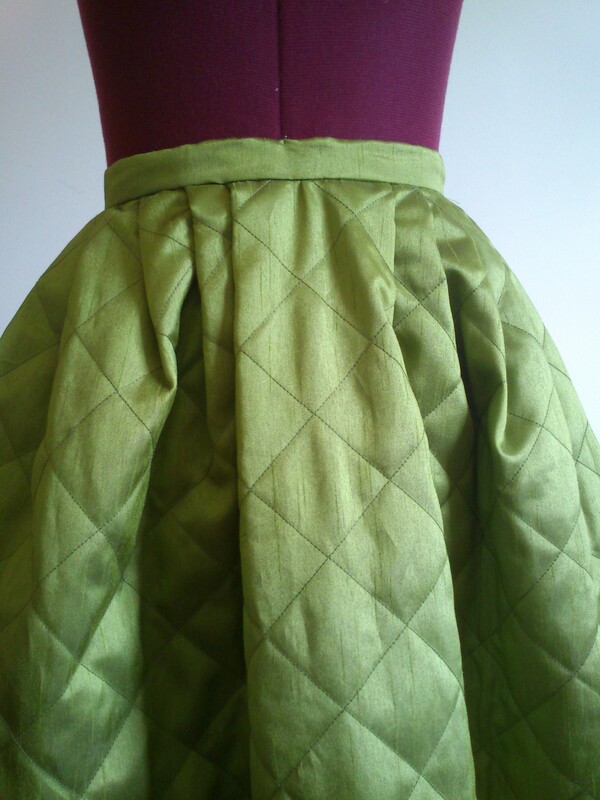 Then I hemed and faced the skirts inside with a plain green cotton weave. I took some basic measurments on the length and cut the excess off at the waist. Then I did some math to calculate the depth of the pleating to fit the waistband. 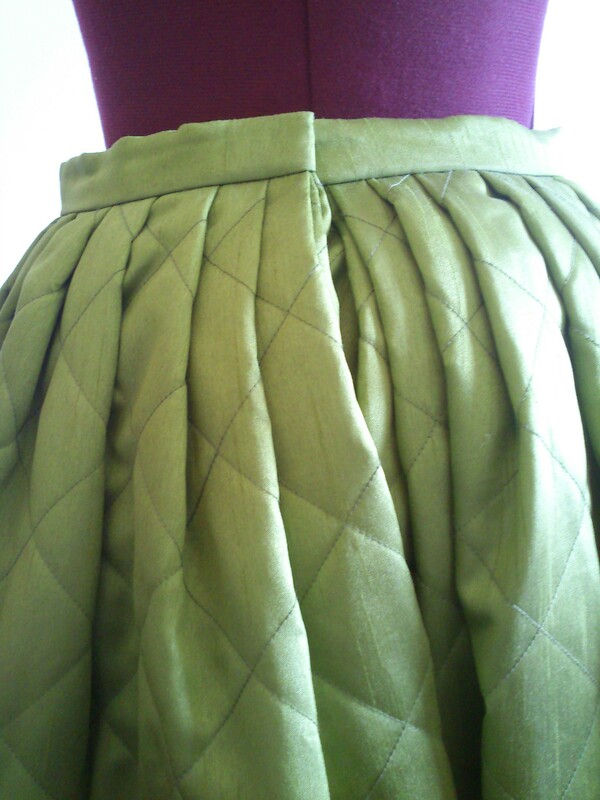 I pleated and sewed the waistband on to the skirt. Then I finished off with some hooks and eyes. So simple and fast. It only took me one evening to make, and I immediately felt the need to make one for my sister. I’m really proud of my time management this time since I made this petticoat the night before me and my sisters were supposed to have the photoshoot. The petticoat is really comfortable to wear and works perfect both as a hidden petticoat under skirts for some extra fullnes, and as a skirt on its own. 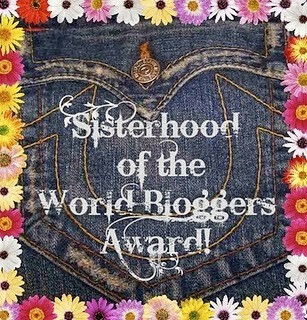 And I love that it matches both my new robe anglaise and a jacket I made a year ago. It makes me feel like I for once actually planned my historic wardrobe. Here are some detail pictures of the skirt, and also a couple of pictures of the skirt in action paired both with the Anglaise of satin trouble and the flowery printed jacket I’ve told you about in previous posts. Front and back of the pleating and waistband. 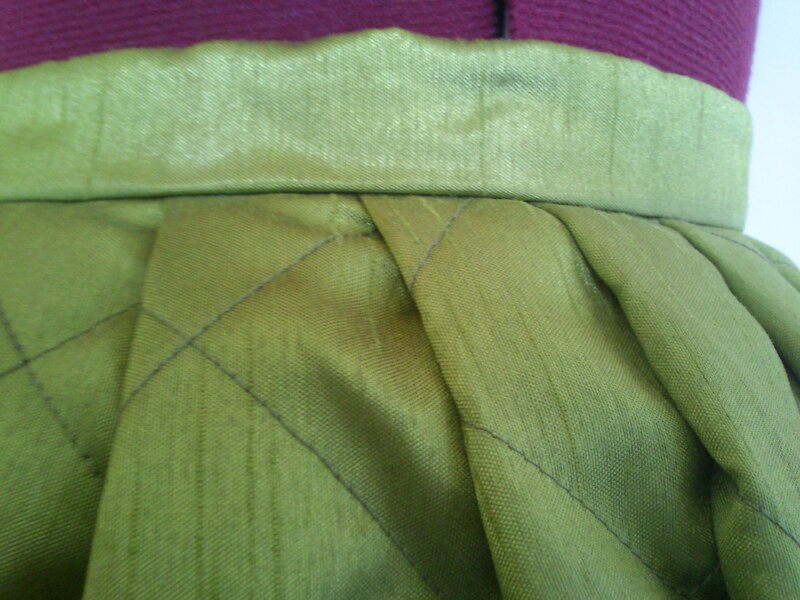 Fabric: 2 m of green pre-quilted polyester taffeta, I also used about 0,5 m of plain green cotton weave for the hem facing. How Historical Accurate: Not really – all machine-sewed in polyester fabric. The only right thing about it is the pattern, so maybe 20 %. First worn: On 9th of may for the photoshoot.